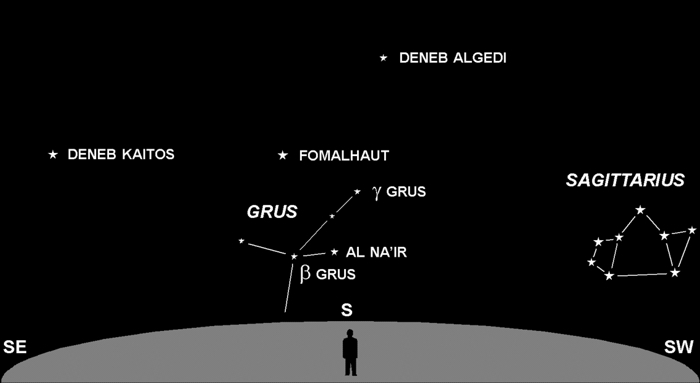 Grus, The Crane, is one of the most elusive constellations in our sky. If you lived farther south on this rock, Grus would be easier to see. But for us northern hemispherians, it lies so low that normal atmospheric haze often obscures it. Its brightest star, Al Na’ir, will rise to only 9° above the horizon. That’s about the width of your fist at arm’s length. Look for it just below the more easily seen Fomalhaut, which is the brightest star in that area. If you manage to bag the Crane, you have good eyes and better than average sky clarity. Except for Fomalhaut and the other two brighter stars, Deneb Kaitos and Deneb Algedi, the sky in this general area seems pretty empty compared to other regions. This is, perhaps, a good time to ponder why it’s called “space.” Fact is, space is mostly empty. All the stars, planets, comets, asteroids, dust and gas that exist take up a mere 0.000001% of the space they reside in. This means outer space is actually 99.999999% pure nothingness. That we can see these distant stars at all is a testament to their intrinsic brightness. Of course, having all that empty space between us and them also enhances their visibility.